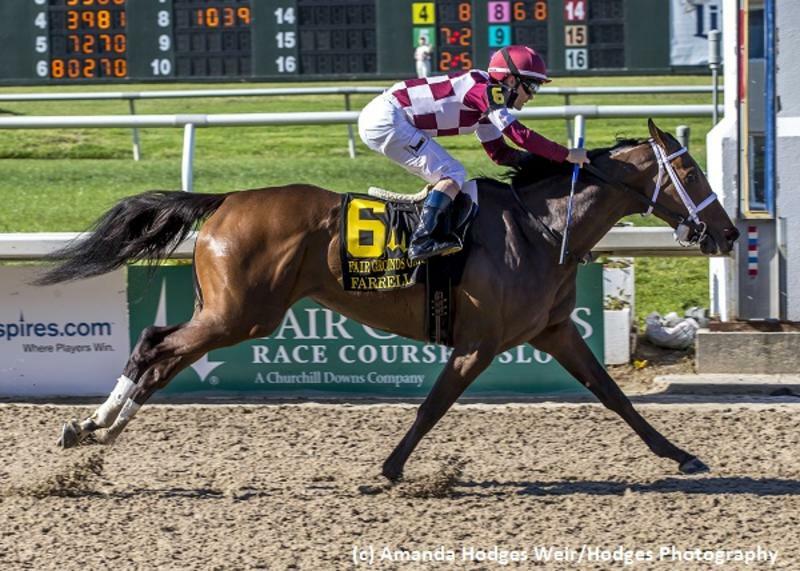 Farrell completed a sweep of the Fair Grounds series for three-year-old fillies headed to the May 5 Kentucky Oaks (G1) when romping home by 3 1/4 lengths in Saturday’s Fair GroundsOaks (G2). Regular rider Channing Hill, who has now been aboard the Malibu Moon filly for all of her seven career starts, guided the dark bay miss through 1 1/16 miles in 1:43.67 over the fast main track. Unlike in her previous races, Farrell was on or near the lead, instead finding herself taking a wide trip to the winner’s circle as the 2-5 favorite for trainer Wayne Catalano and owner/breeder Coffeepot Stables. Farrell got the job done despite drifting a bit in the lane, adding 100 points to her previous total of 70 points toward a starting berth in the Kentucky Oaks. The Fair Grounds Oaks is part of the Road to the Kentucky Oaks and awarded 100-40-20-10 points to the respective top four. Wicked Lick took full advantage of the 40 points to bring her total to 49 and position seven on the Kentucky Oaks Leaderboard. The chestnut lass finished second in the Silverbulletday Stakes and fourth in the Rachel Alexandra Stakes (G2) behind Farrell previously, and this time around managed to stick her nose in front of 7-2 second choice Vexatious to be runner-up. Vexatious debuted on the Kentucky Oaks Leaderboard in 12th after earning 20 points here, 7 1/2 lengths up on Daria’s Angel in fourth. That early pacesetter earned 10 points. Farrell is now 7-5-0-1, $601,357, in her career. By taking the Fair Grounds Oaks she swept that tracks series of three-year-old filly stakes leading up to the Kentucky Oaks. The Kentucky-bred miss is now stranger to Churchill Downs, kicking off her racing career under the Twin Spires and closing out her juvenile campaign with a gate-to-wire, six-length victory in the Golden Rod Stakes (G2). Out of the stakes-winning Unbridled’s Song mare Rebridled Dreams, who finished second in the 2003 Silverbulletday when it was a Grade 2, Farrell is a half-sister to Grade 1 victors Carpe Diem and J. B.’s Thunder.